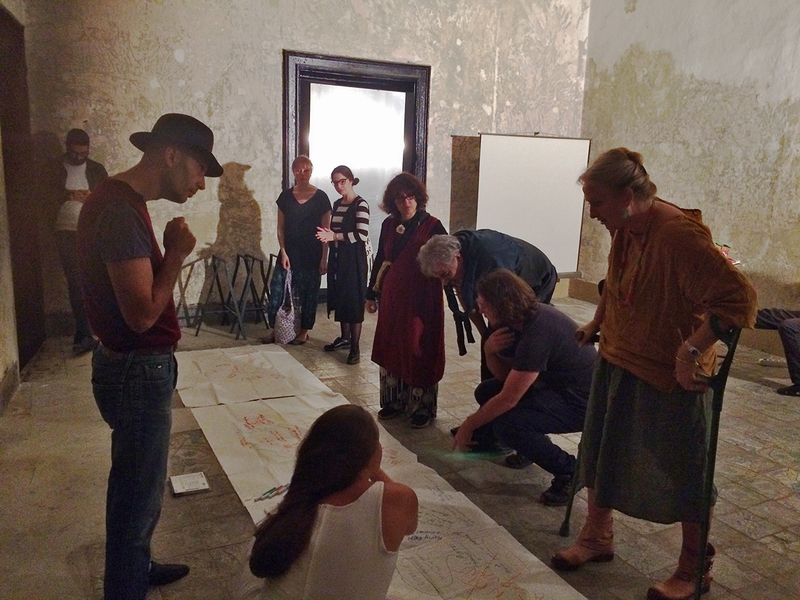 In October 2017 the Collective Intelligence group was invited to spend one month in Palermo and work together with Dimora Oz, an artists-run association focusing on relational art and place-making processes. This initial choice led to a chain of very fruitful events and activities. With this text I wish to share some reflections about the process lasting from October 2017 to November 2018. From the beginning of its activity, Collective Intelligence (CI) has been moving tangently to the Pixelache community. CI production team independently seeks the collaboration and patronage of institutions and funders to support CI activity, and the distribution of the results sometimes benefits from the Pixelache network. 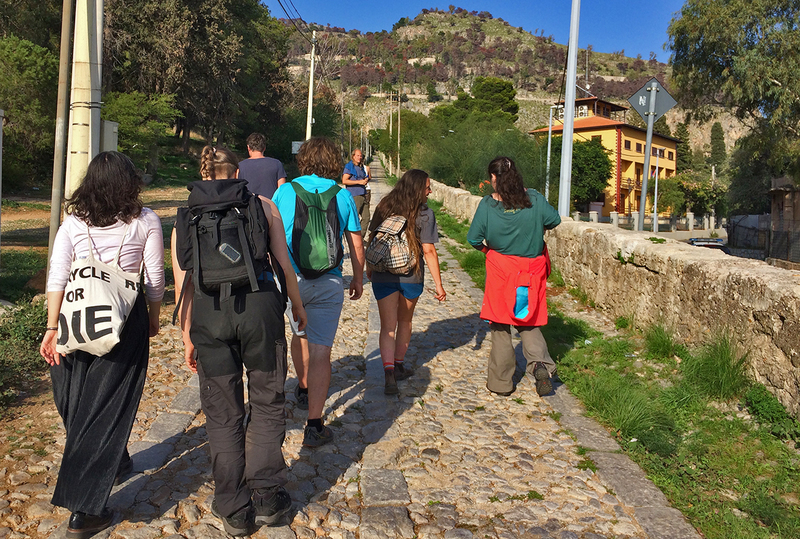 The workgroup traveling to Palermo in 2017 was formed by Pixelache members Alan Bulfin, Antti Ahonen, Egle Oddo, Krisjanis Rijnieks, Saša Nemec; by artists Erika De Martino, Marjatta Oja, Milla Martikainen, Timo Tuhkanen, Jytte Hill, Ionas Amelung, and by project manager Johanna Fredriksson. The idea was to spend time together as a creative group and to discover common ideas, shared paths and intuitions, during our daily convivial routines. 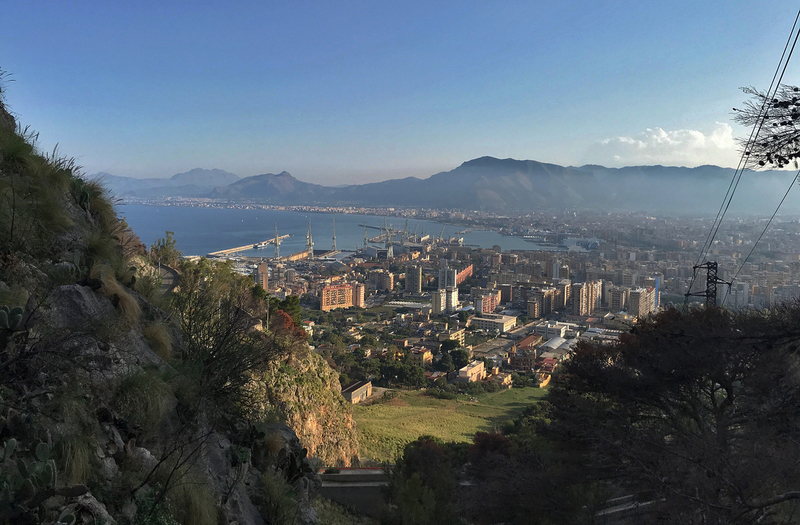 We stayed at a house in Mondello close to the seaside of Palermo, and while one could say that we were busy living and working together non-stop, the atmosphere was of pleasant excitement and discovery. Very seldom a large group of professionals of the creative field has the possibility to spend time together without the pressure of a given outcome. I found this initial possibility to think together extremely precious, and somehow I am convinced that that was the key of the success of the project. Part of CI group ascending the Pilgrim mountain, October 2017. "What do we seek? Unexpected assemblages, intuitive actions and heuristic knowledge" I wrote in 2017 before starting our trip to Palermo. 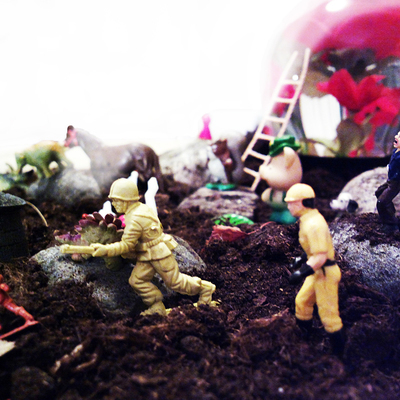 What is heuristic? If one would search for its original meaning, it is not rooted in computational science, nor in empirical knowledge. The Greek term εὑρίσκω literally 'I discover', is a philosophical discourse the main purpose of which is to find new facts that were not known at the beginning of the investigation or research. A method to produce new knowledge. And indeed we were very busy with two important discoveries: the influence of our subjectivities in the group, and the definition of the context in which we wanted to operate together. Alan Bulfin was immediately busy with the context. During our breakfasts, he involved the whole group to reflect about the geo-political and social context in Sicily, drown by its complexity and apparently impossible classification. Slowly, on the A1 papers covering our breakfast table, started to appear a labyrinth, a rhizome of words, drawings, signs, colours. The Breakfast Papers were taken to several places, they were the diary and the mind-map of the group, they were shared with Dimora Oz artists who added their inputs, and were finally shown at Dimora Oz gallery during one-month exhibition and activities. The Breakfast Papers exhibited at Dimora Oz in Palazzo Barlotta Principi di San Giuseppe, October 2017. However we were struggling to position our creativity and ourselves in the context where we were. Conversing together we came to agree that the context is not the background of the action, it is not inertly available to be interpreted, used, populated, compared, defined, included. The context is a participant. And that seemed the only honest way we could relate to it as a group. After we had this intuition various things started to happen at individual and collective level. We were tired to talk, and to communicate mainly verbally and textually. 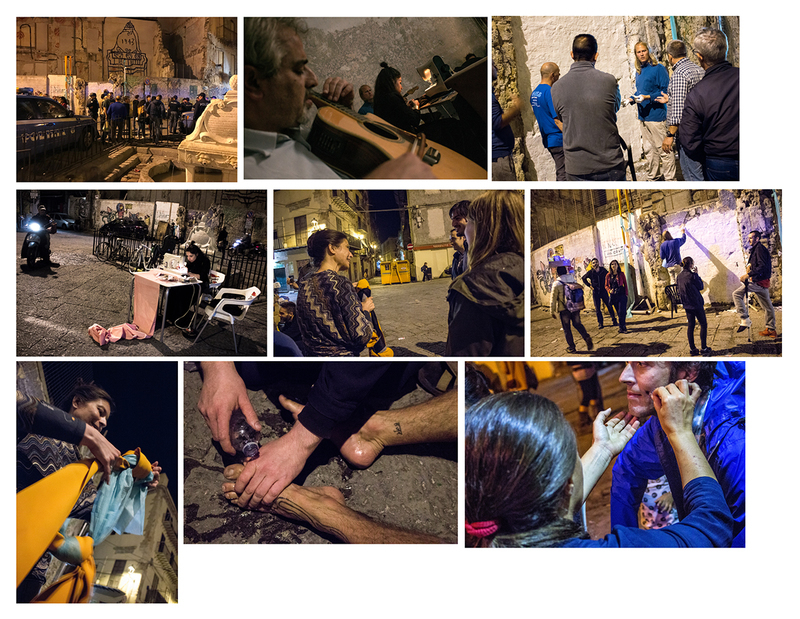 During a public event, we performed together indoors in Palazzo Barlotta and outdoors in Piazza Garraffello, in the heart of Palermo historical center. The actions of CI group occurred in collaboration with local artists and with the inhabitants of Garraffello district. This happening supported the birth of an affective relation, a bond, a thread with the context. To explain this delicate choreography of emotions in terms of generical cultural production would probably be reductive. CI happening at Palazzo Barlotta and Piazza Garraffello, October 2017. Several curators noticed our activities. Lori Adragna contacted our group. Enzo Fiammetta, the Director of the Museum of Fondazione Orestiadi, invited us to visit their foundation. Some of the assistant curators of Manifesta attended our events. Encouraged by this interest, we applied for a residency with Fondazione Orestiadi and we filed a proposal at the open call for Manifesta 5x5x5 program. We won both. The program Collective Intelligence presented could be checked at Collective Intelligence in KaOZ, Growing a Language, IL TRAFFICO. But frankly speaking, the most important and beautiful part of our program was available only inside the specific situations generated by us with the context. My speaking of success at the beginning of this text is not related to the fact that we got everything we asked for, that we were included in the programs we applied for. To keep an artistic process fresh, loose, spontaneous and genuine, and at the same time to gather interest around it, from media, from colleagues and from the public, is a rare combination of factors. In my opinion the success of the project has been to resist over-production, to resist stretching over the limit when the resources where limited, to resist overgrowing the project at any cost. I see the success of Collective Intelligence rooted in its intense yet inconspicuous relational research. 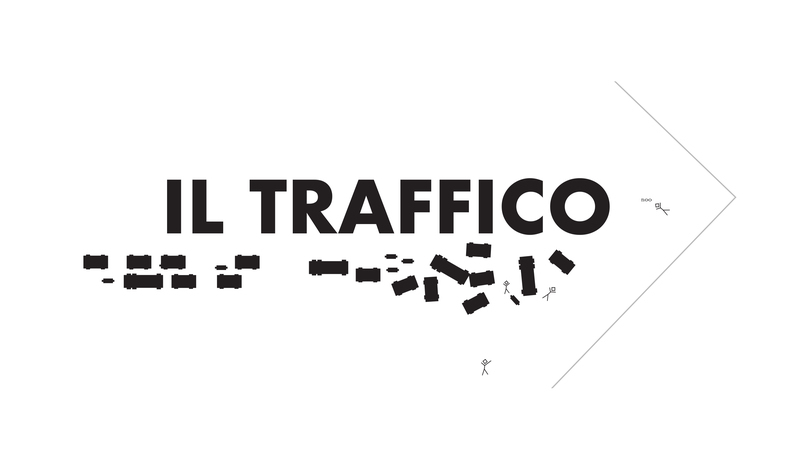 From the first common artifact, the Breakfast Papers, to the exhibition IL TRAFFICO closing our activity in Sicily, we managed to stay true to our needs, hopefully without impersonating the needs imposed by external pressure. Credits for the pictures: Johanna Fredriksson, Antti Ahonen, Timo Tuhkanen, Angela Benivegna, Krisjanis Rijnieks. Article on La Repubblica: the first public presentation of Collective Intelligence project at The Day of Contemporary Art held by AMACI, the National Association of Contemporary Art Museums in Italy. Speaker Egle Oddo, performance Timo Tuhkanen. First public event of Collective Intelligence in Palermo, advertised by Italian press. Collective Intelligence participates at Le Vie dei Tesori cultural event. Program of Le Vie dei Tesori. Article by Liisa Vähäkylä on VOIMA magazine about Collective Intelligence participation at Manifesta12. The Finnish Institute in Rome advertises Collective Intelligence activity in Sicily. Cultfinalndia, the site supported by the Finnish Embassy in Italy to showcase cultural projects. First focus on Collective Intelligence. Cultfinalndia, the site supported by the Finnish Embassy in Italy to showcase cultural projects. Second focus on Collective Intelligence.